Shallow Cogitations: What Was That About Judge Not Lest Ye Be Judged? Brendon T. Kaluza-Graham was shot in the back of the head while driving away in a stolen Chevrolet Suburban, an easy picking that was idling in the owner's driveway. Was the owner in the right to kill Brendon? If Brendon was your son, would you be satisfied that he was justifiably killed? If Brendon had a history of drug use, multiple car thefts, and even brandished a knife at a sheriff's deputy once, was he justifiably killed? For a number of pseudonymous people leaving comments on articles written by Shawn Vestal and Jennifer Pignolet in today's Spokesman Review, Brendon's criminal record justifies that he got what he deserved. For them the question whether the owner was legally justified to take the young man's life is far less applicable to the situation. The rationalizations abound. He shouldn't have been on the street anyway. Getting shot is a hazard of being a criminal. His family failed him. Don't sympathize with criminals. He was on his way towards becoming a career criminal anyway. Problem solved since the police don't investigate property crimes. The owner saved Brendon from a life of crime. To be fair, some commenters do question the morality and legality of the use of deadly force by the vehicle owner. Sadly, they're essentially shouted down by those unaware of or ignoring an important lesson from the Sermon on the Mount. Be prepared to be judged by the same standard you apply to others. No doubt those who believe Brendon got what he deserved have short memories of being unjustly or harshly punished. This morning I saw this young man sleeping under the Washington Street bridge at Riverfront Park. 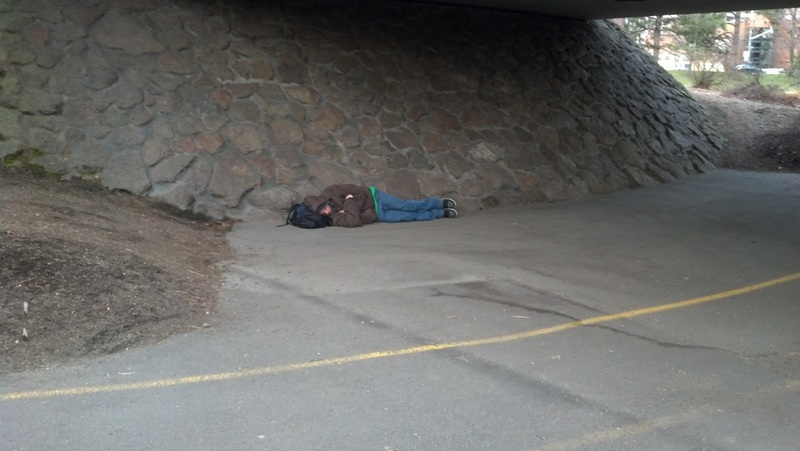 Does the fact he's sleeping under a bridge influence how you think of him? Someone could look at it this way...was Gerlach (the shooter) baiting? After being frustrated with property crimes, his 16 year old suburban is idling in the driveway while he's packing heat wating for it to be stolen.